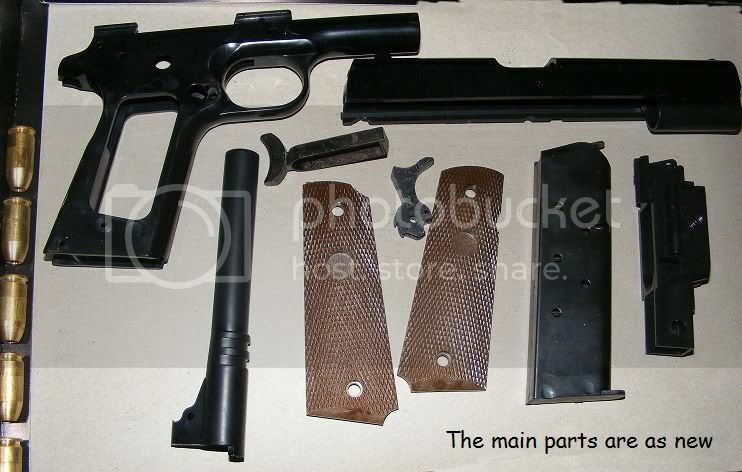 As part of the Browning Colt 45, 1911 Centenary I bought a kit set on this forum in order to review the Marushin Model compared with my other types of 1911 Colt. It arrived without any hassles and along with the English Instructions came some extra work! And it must have been a very old kit judging from the unopened packages having many parts with signs or corrosion and rust. Part 3: A Comparison and Review of my Model 1911 Colts (Under Smottik's Challenge post). removing excess plastic & metal; sizing parts to make sure they will fit; lubricating some of the mechanisms etc. But this kit showed signs of being quite an old one, with English Instructions (for the American Market) and as the photos below show, quite a few parts required extra attention. Yes, in case you never knew, Coke is good for cleaning most metals - coins in particular, if left over night! Part two will follow shortly! Well done Kiwi, we are with you for the rest ! If you can, scan the manual because the english is very rare. I have already buy kits with metal parts very rusty...Yes, I think it's because these kits are quite old. Thanks guys for the encouragement (The Instructions are scanned and posted). This next installment covers the sequence up to the all-important sear/disconnector assembly. Download the instructions and follow the pictures! if you wish ! The first task is to remove a little piece of plastic on the frame during manufacture. And then cleaning any burrs or roughness on the frame reinforcing. Now you can install two pins holding the ejector plate: DO NOT GET THEM MIXED UP LIKE I DID OR YOU WILL GO NUTS TRYING TO GET THE ACTION TO WORK AT ALL! 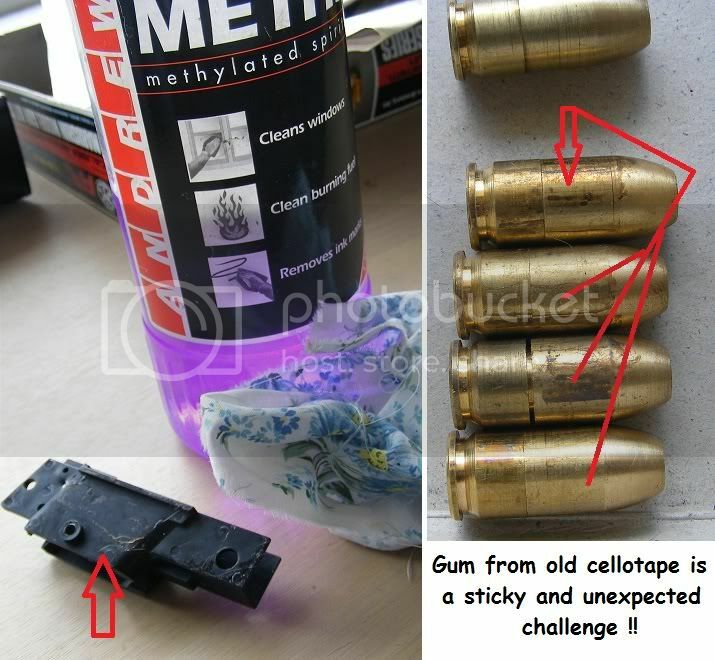 NEXT JUST DROP THE TRIGGER INTO PLACE AFTER OILING IT. 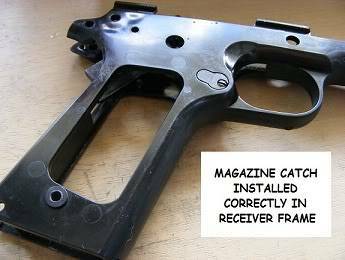 ASSEMBLE AND INSTALL THE MAG CATCH. Before you go any further check the Slide on the frame for ease of movement and remove any rough patches of scrap plastic. This next bit is fiddly but after a bit of practice it gets easier - and I ended up getting a LOT of practice! This brings back memories! I built all of my modelguns from kits, including this version and the Combat Commander. All of mine were supplied with English instructions. I never threw them away, but I can't locate them (4 house moves since!) They must be in a box in the loft. I will find them; I am going back into the loft to look for 200+ 35mm slides that I want to scan, so I'll have another look then. HI Browning - glad to know there may be more English Instructions coming our way! My copy in English is here below the Japanese versions. The hammer and strut are pretty simple, but the pin is prone to dropping out. Use calipers to measure the length is correct. The sear spring MUST be installed onto the sear, not under neath it - which is easy to do by mistake! Then the main spring and its housing are assembled and GENTLY slid into place over the sear spring. The whole assemble is as yet un-pinned, so go easy. Now STOP: re-check the sear is correctly sprung; ease the housing up and place the hammer strut into its cap - you will feel the spring pressure start to build as you do this. Now hold the receiver/frame in your hand lift it and get the retaining pin ready (rounded end goes in first). PUSH DOWN FIRMLY on a hard surface with one hand, simultaneously pushing in the pin as far as you can with your other hard - then tap it quite hard to drive it all the way through and out to the other side of the frame. This requires a bit of fore-thought and maybe a trial run or two. THE 1911 COLT IS FAMOUS FOR ITS double safety FEATURE. WE CAN ASSEMBLE THIS IN THREE STAGES. Next - ease the Grip Safety under the main housing, onto the sear spring and in-between the frame. It takes a little pressure, but it does go quite in easily. Then insert the Thumb safety catch into the frame hole and push it in until it is resting on the safety plunger. Now you can use a small blade to compress the plunger and fully install the Thumb safety. Ensure it is at the right angle (refer to instructions). 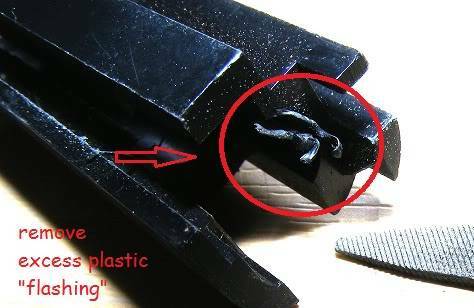 BEFORE GOING FURTHER, CHECK THE OPERATION OF THE HAMMER, TRIGGER AND BOTH SAFETIES. LUBRICATE EVERYTHING WITH OIL. THEY MAY BE A LITTLE STIFF AT FIRST BUT GENTLY WORK THE VARIOUS BITS UNTIL YOU ARE HAPPY THEY WORK CORRECTLY. IF THEY DON'T THEN YOU WILL HAVE TO DISASSEMBLE DOWN TO THE SEAR, AND MAKE SURE NOTHING HAS SHIFTED OUT OF PLACE - THEN RE-ASSEMBLE AND TRY AGAIN UNTIL YOU SUCCEED! ONCE IT ALL WORKS OK, YOU CAN PUT ON THE HAND GRIPS - AS PER NORMAL. I must say it's really a perfect tutorial !! And it's really a big work ! Anyway, congratulations and I wait for the end. I'VE BEEN OFF WORK WITH A CHESTY COUGH THE PAST WEEK, SO LUCKILY I HAVE THE TIME TO SPARE! I hope it's not too big for people to follow... but we're almost there! FIRST PREPARE THE BREECH BLOCK BY REMOVING EXCESS PLASTIC AND TIDY UP ANY ROUGH SPOTS. NOW YOU CAN ASSEMBLE AND INSTALL THE EXTRACTOR. 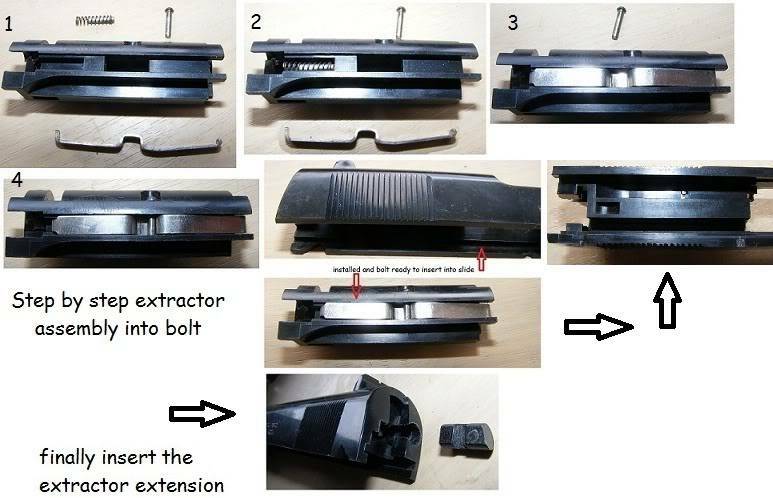 AFTER WHICH YOU CAN CLIP THE BREECH BLOCK INTO THE SLIDE, AS SHOWN BELOW. FOLLOWED BY THE FIRING PIN ASSEMBLY. I DISCOVERED THE INSIDE OF THE FIRING PIN WAS FULL OF RUST - SO IT TOOK SOME FILING WITH A SMALL ROUND FILE TO CLEAN IT OUT! SECURE THE FIRING PIN ASSEMBLY WITH THE RETAINING PLATE - WHICH JUST SLIDES INTO THE SLOT IN THE BACK OF THE SLIDE. 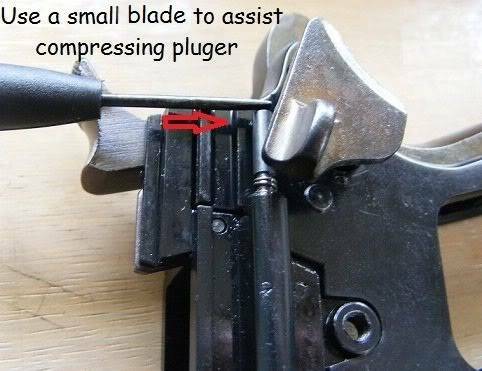 USE A SMALL BLADE TO COMPRESS THE FIRING PIN. 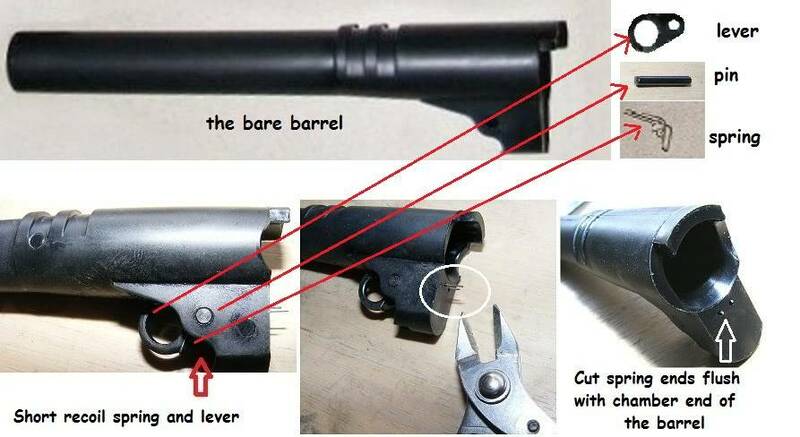 MOVING ON TO THE BARREL, PLACE THE SHORT RECOIL SPRING OVER THE END OF THE SHORT RECOIL LEVER. PUSH THE TWO PINS OF THE SPRING INTO THE HOLES IN THE BARREL BELOW THE CHAMBER, AND SECURE WITH THE PIN. CUT THE EXCESS LENGTHS OF THE SPRING WIRE FLUSH WITH THE PLASTIC BELOW THE CHAMBER. INSERT THE BARREL CHAMBER FIRST INTO THE SLIDE UNTIL IT BUTTS UP AGAINST THE BREECH BLOCK. THE PLUG GOES IN FIRST, THEN THE SPRING. 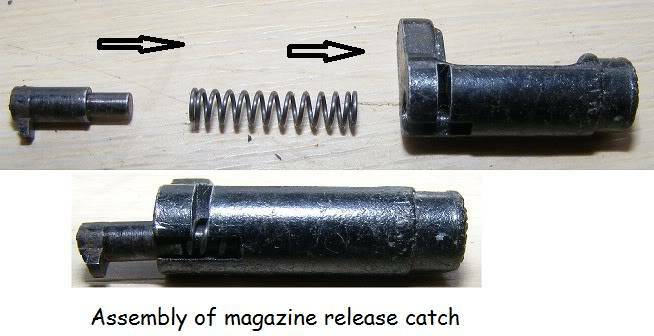 FINALLY INSERT THE GUIDE AND CAREFULLY COMPRESS THE SPRING AND PLACE THE GUIDE FLANGE (WITH A "U"-SHAPED LIP ONTO THE BARREL NEXT TO THE SHORT-RECOIL LEVER. DO NOT WORRY IF IT FLEXES ABOUT. THAT'S NORMAL! AFTER INSERTING THE BARREL BUSHING AND CLIPPING IT INTO PLACE - FINALLY INSTALL THE SLIDE ONTO THE RECEIVER/FRAME, PUSHING CAREFULLY UNTIL THE HOLE FOR THE SLIDE-STOP LEVER LINES UP WITH THE SHORT-RECOIL LEVER HOLE. PUSH IN THE SLIDE-STOP LEVER ABOUT 95%. YOU WILL SEE A SMALL RAISED SPUR ON IT. PUSH THE SLIDE SOME MORE UNTIL THE SMALL NOTCH IN IT IS ALIGNED WITH THE SPUR - THEN PRESS IN THE SLIDE-STOP LEVER THE REST OF THE WAY - AND RELEASE THE SLIDE. OFF COURSE USE SOME LUBRICANTS TO EASE THE FLOW! WORK THE ACTION A FEW TIMES TO ENSURE IT'S ALL WORKING. 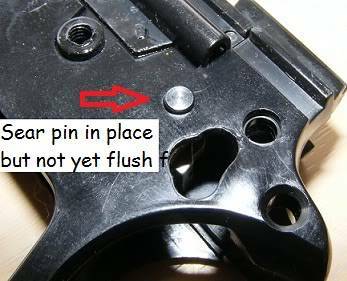 THEN INSERT THE MAGAZINE EMPTY TO CHECK THE SLIDE STOP WORKS, THEN FULL TO CHECK THE ROUNDS ARE CYCLED EACH TIME YOU PULL THE SLIDE BACK. ALL THAT REMAINS IS TO LOAD THE CAPS INTO THE CARTRIDGES AND GIVE IT A TEST-FIRE, AND AS MODELGUN OWNERS WILL TELL YOU -THAT'S ANOTHER STORY! P.S. My magazine was already assembled when the kit arrived - so read the instructions page if yours is not! 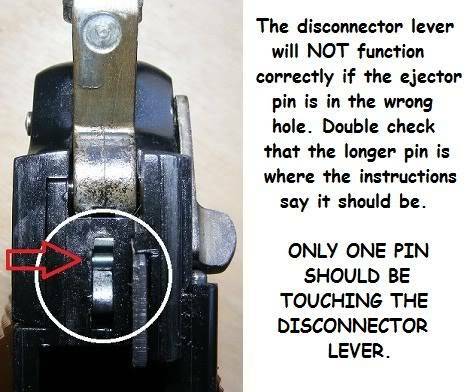 Thought this is worth mentioning - If you find that the Slide/Barrel hard to remove, it is most likely due to the recoil spring metal GUIDE jamming at an angle inside the slide. The solution: gently slap the side of the Slide with the flat of your hand. That should release it without further problems. To say I enjoy it would be an understatement! It's a joke, of course, great job Kiwi and now, I have to do the same thing with all my kits. Who can keep my children please??? Absolutley superb i am very impressed the photo's are great.i have this model kit myself got the M29 as well might even be tempted to try to build mine with such a good step by step guide. I'm pleased that you have all found it useful & enjoyable. I'm so glad I don't have to translate it into Polish or French or Welsh! If it is an inspiration to others to get more out of their Modelgun hobby - that's fantastic! I'm a relative newbie and have gained so much info fro the forum posts - thank you Claymore too. All the feedback is appreciated. I sure am addicted now - and with this model in particular I've learnt to appreciate the genius of John M. Browning AND the skills of the Japanese Modelgun designers and manufacturers.